home / Multimedia / The Holy Land in news / Books bridges of peace in Jerusalem: meeting and sharing with ..
Culture and books as a meeting occasion. This was demonstrated by the study day of January 16th, organized by the Hebrew University of Jerusalem at the Convent of San Salvatore. 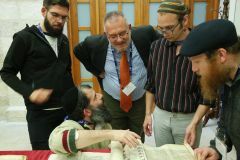 The Custody of the Holy Land hosted 30 boys, mostly Jews, from the Winter School of the Israel Institute for Advanced Studies who participated in a lecture given by dr. Alessandro Tedesco and Professor Edoardo Barbieri of the Catholic University of Milan, on the history of the Franciscan Library in Jerusalem from 1500 to the present day. The collaboration with the Winter School is the result of a beautiful friendship between Professor Barbieri and a young Israeli scholar, Ray Schirer, a frequent visitor to the bibliographic exhibitions that are organized every year for “Books, bridges of peace“, the project born in collaboration between the Custody of the Holy Land and the Creleb (European Research Center, Books, Publishing, Library) of the Catholic University of Milan and ATS Pro Terra Sancta. The cycle of lessons has seen the presence of high-profile personalities, such as the renowned Renaissance culture scholar Anthony Grafton of Princeton University, prof. Joseph Hacker of Hebrew University, prof. Eichanan Reiner, scientific director of the National Library of Israel (NLI), and the participation of a large group of students from both Israel and Europe. Ray strongly wanted the General Library of the Custody to be involved in the project. During the lesson the dott. Tedesco has shown some of the treasures that tell the story of the Library: from the ancient chorales to the fifteenth-century printed books that arrived in Jerusalem at the beginning of the sixteenth century. Moreover, for the guests the exhibition “The Bible on the move” exhibited in the premises of the Custody last November was re-organized for a day. After the presentation of the material by prof. Barbieri, curator of the exhibition, has in fact been able to observe more closely and handle some of the precious books and manuscripts on display, and then discuss them together in a short seminar. A cordial meeting that left all the participants visibly satisfied: “It was very kind of you to set up the exhibition again to allow us to enjoy the vision in detail of many biblical texts of the Custody” declared Ann Blair, director of the course of the Harvard University. “It was a very nice event, which showed off the real treasures of the library. The students appreciated the experience and the teachers are thinking about future collaborations”. 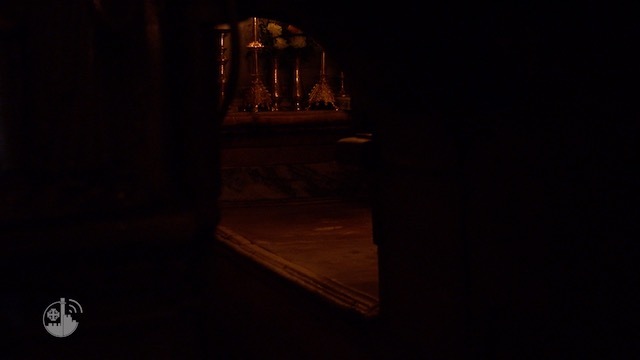 For Alessandro Tedesco, who held the seminary’s lecture, it is not the first visit to Jerusalem. He was one of the first students to take part in the “Books,bridges of peace” initiative as a civil service volunteer in 2012, and since then he has never stopped collaborating with the Library. Continue to follow the information management part of the site and the catalog and carry out study and research activities. He strongly believes in this project: “The peace that we propose and imagine is a peace linked to culture. Through the book heritage, to create empathy and to make people aware of different ideas and religions the Custody of the Holy Land and the local Christian reality. When you ignore who the other is, it is very easy to be afraid of him or her”.